I have now built two of your designs and greatly appreciate your work. If it is helpful please feel free to add any of this to your builders response pages. Please let me know if the photo resolution is too low and I can resend any that you might want to use. 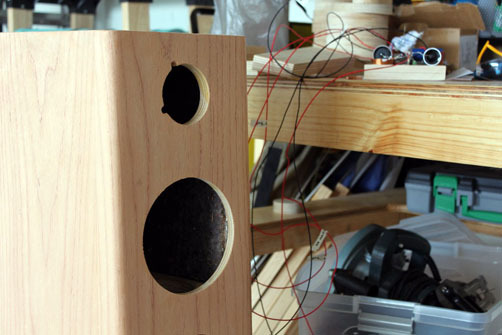 These were my first foray into speaker building and serious woodworking full stop. The Nomex 164 seemed like a good starting point as it was relatively simple, economical and big enough to make some impact. So I dusted off my old circular saw, made a couple of cutting jigs and bought myself a router and soldering iron. 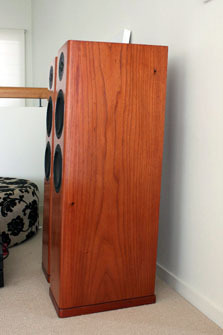 The cabinet was built with 25mm Hoop Pine plywood which I then veneered with 0.6mm Australian Red Cedar (Toona Ciliata). 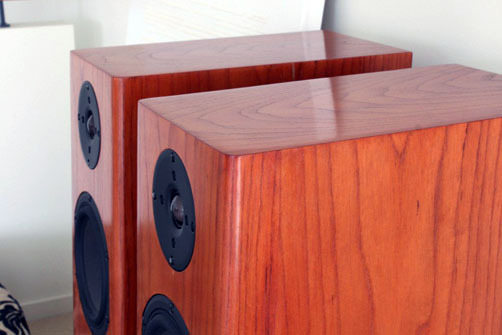 Although the Hoop Pine is relatively light the cabinets are rock solid. To achieve a seamless veneer I routed the driver holes, fully assembled and glued the cabinets, applied the veneer and then routed the rebates for the drivers using some templates I made. This could have ended in tears if I messed up the driver rebates, but luckily all went well. I also decided to follow your tip on tilting the cabinets. I cut the cabinet panels to get a 4 degree tilt and flat cabinet top. This helped with WAF. Oh and I made the cabinet deeper to increase the volume, although I misread the instructions and thought I was aiming for dimensions that gave me 45 litres. I assume this did no harm. 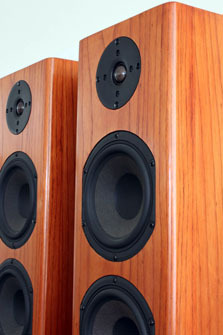 The Jantzen parts were purchased from Brisbane based Speaker Bug. I did upgrade a couple of the capacitors to the Silver Z caps. The damping is a commercial felt carpet underlay that from memory was 11mm thick. After some searching I found a carpet store that had some leftover from a job and picked up heaps for $20. The bitumen padding was a little trickier to find and I ended up buying some from that huge US online shop. Later on I found a distributor in Sydney for a Bostik product that seemed good, next time maybe. I was a little slack with taking photos during the build so there is not a lot to see. I do the messy work out in the garden in a nice shady spot out of the Queensland sun. The Nomex 164 replaced some Quad 12L's. It is not a fair comparison to compare a 12 litre speaker to a 45 litre but I certainly noticed a huge difference, not just in bass but across the board. They did take a while to run in. My daughters 18th birthday party certainly finished off this process and they did the job admirably. With the previous speakers I had to heavily use the equalizer in J River Media Centre to compensate for deficiencies, with the Nomex 164 I have all frequencies set flat and it sounds great. 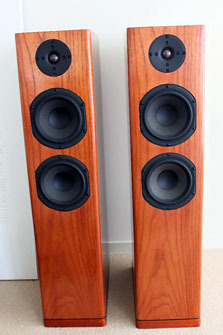 For the $1,000 AUD in parts and materials that these cost me they are fantastic speakers. 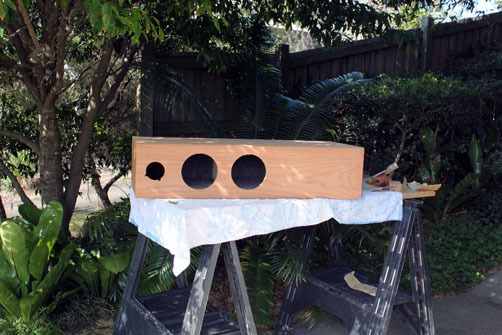 It certainly reinforced to me that DIY loudspeaker building is enjoyable, rewarding and very good value for money, assuming you have the time! 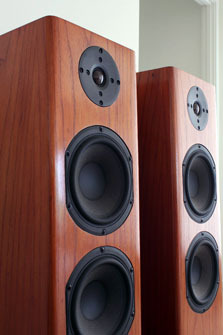 These speakers were a warm up for me and I have now also made your DTQWT's. I will send you some photos also. Thank you so much for making your designs available to everyone.